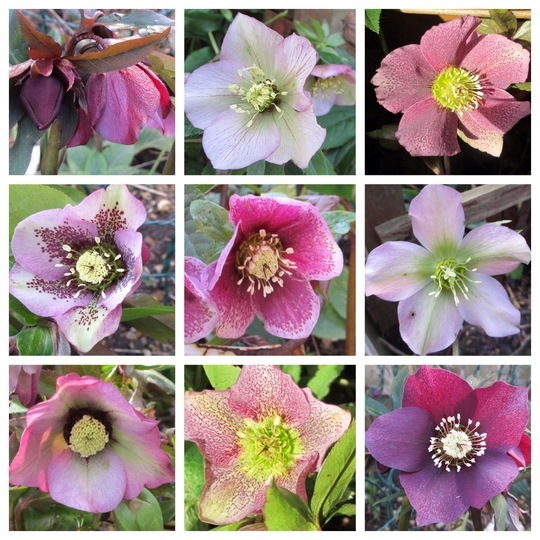 Here are some of the Hellebores I have growing in the garden from seed, self sown or my crossing, pictured yesterday. Today I’ve spent a couple of hours removing about 1/2 doz plants that I didn’t like the colour of. Below is the nicest I’ve found this year, a pale pink double from a deliberate crossing. I feel that the doubles are not as strong growers as the singles. I had two lovely deep pink doubles flowering last year, but this season they are each just a couple of miserable leaves. What do other members think about the sturdiness of doubles.? They are beautiful. The pink one is especially gorgeous. A wonderful collection you have there like Majories the crossing double pink well done. All from seed - I am so impressed. I only have two and they are planted at the furthest point from the house so I don't see them much. I read that they don't like to be moved once established so I haven't tried. Yes, Ginellie, I read that about being moved, that might have been the problem although I cut out a fair amount of soil around the roots. Oh Siris, what a splendid collection of hellebores. Each one is very pretty and to have grown them all from seed is a real achievement. The deliberate cross is dreamy- you must be thrilled with it! I only have two doubles but they seem to be doing quite well (the red is on one of my recent pics) though the plants don't look quite as robust as the singles. You have a fabulous collection altogether - bet you have a big smile when you go down the garden! You have a nice variety of colours there. I get many seedlings from mine but they never seem to flower. Thank you all for your kind comments. 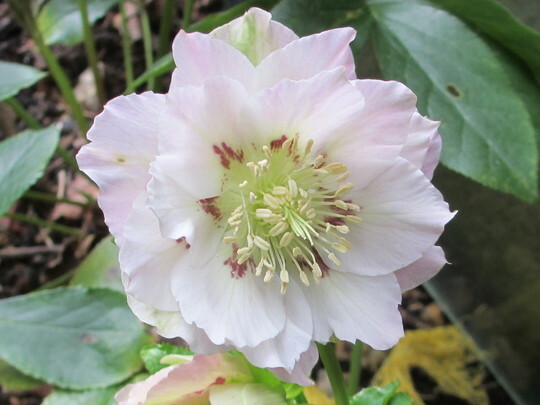 Some of my Hellebores are in deep shade, so haven't opened the flower buds yet, also my planting-out bed is shady, so if I find a nice one I move it to a display place. That's probably why they sulk afterwards. Ha,ha, Stera, the garden isn't big enough 'to go down it'. Hywel you once gave me a red one that has only just started flowering well - I thought it was one of your seedlings? Those are lovely ! Well done Siris. Siris, today I noticed one I didn't recognise from previous years, it must be one I grew from your seed, I must take a photo. When you do a deliberate crossing do you take a note of the parents so that it can be tried again if it fails to flower the 2nd year? You must have a lot of patience to go to all that trouble and maybe wait years for flowers but this must be very satisfying. Have you thought of registering the pink double with the RHS? Bjs has also done deliberate crossings and some of his primulas are available with Stradbrook as part of the name. Scotsgran, I only know the the colour of the double ones, that is from which neighbour I got the pollen. My goodness didn't you do well, some real beauties there ! You have done a spectacular job. Dawn, do put a pic up. It might be one of your own, self seeded, they are prolific seeder, but variable. I think I read somewhere that spots are a dominant trait. Thank you Dd, & Sgran. The doubles seem slower to come into bloom (or maybe it's because they are tucked away in a shady seed bed) when they are flowering I will do a composite pic. (I've found the deep pink spotty double flowering, only one leaf though. Flowering at Home yesterday 4th December.